Blain: "Market Stability Worries Me: It Feels Like We're Sitting On Top Of A Volcano"
Escalation or Poker? Frayed markets and the RICH Index. What does Deutsche's exit pursued by bear actually mean? Delusional Escalation or a well played poker hand? I guess we won’t know till someone blinks on the Trade Game with China. Or, how will Putin respond to Trump’s bellicosity on Syria after the coiffured one simultaneously trashed the Russian Stock market? Imagine what the papers would be saying if Russia economic action caused a 10% nosedive on the FTSE. Overused phrase of the day is “Return to the Cold War”. It’s the stability of the market’s mindset that worries me – how fragile and fraxious is sentiment? How frayed is the market’s collective nerve? Although all the fundamentals for Global growth remain strong – and we can show literally thousands of data sets to support that - the sweet melody of synchronous growth is being (literally) trumped by the discordant noise of protectionism, clashing chords of populism, and market jitters over the threat of out-of-tune central bank uncoordinated monetary policy. Looking at the stock charts – they look topsy-turvy. Yesterday looks a complete bubble – steadily up in the morning, but a parabolic tumble in the afternoon. This morning, the futures are saying stronger again. It does not look strong. It looks reactive. One read is that we’re setting up for a further test of the lows. Nipping outside our usual safe comfort zone of Bonds, Currencies and Stocks, I’ve been wondering about other signals of potential nervous market exhaustion. Last week one of my horse racing chums was expressing fears after low prices at English bloodstock auctions – his gut feel was this was indicative of broader concerns across money, wealth and investments. 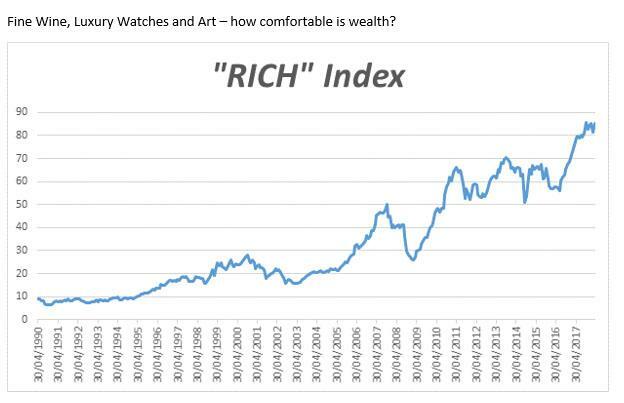 Yesterday I asked my Macro Economist Martin Malone to take a look and he has produced the attached RICH chart looking at the prices of Fine Wine, Art and Luxury Watches – proxies we’ve chosen for how comfortable wealth feels. I’ve attached the index – just ask if you want to see updates. I can’t help but wonder if we’re sitting on top of a volcano? Meanwhile, back in the real world… Deutsche Bank. Deutsche (DB) is just another thread on the much bigger and complex tapestry of financial evolution. Once, DB was Europe’s leading investment bank. Its only real rival was Barclays. Today, it looks set to become a footnote in market history. Their decision to exit investment banker John Cryan as CEO and give the job to a DB lifer says it all. Christian Sewing has been parachuted in with unseemly haste after it became clear the all-powerful Paul Achlleitner was out of patience. Sewing is a commercial banker who started as an apprentice, had a career in risk management, was elevated to the board, and finally into the CEO’s shoes. The read is it confirms the end of the bank’s ambitions as a premier investment bank. But, where does DB go from here? Most of the banking analysts point out there are very limited options. There is lots of underperforming wood to prune – like US operations, its London investment banking hub, trading and FI. It could slash risky investment banking and cut risk to lower VAR and capital costs. Many think its still in recovery after last year’s brush with confidence. However, what would be left if it self prunes is a German focused commercial and retail bank operations, which are low ROE operations. Over the past 32 years I’ve seen many mighty institutions come and go. There was a time when there were half-a-dozen German market contenders: DB was clearly in the top division, while names like WestLB, Dresdner and Commerz were strong in the second league, and smaller players like Vereinsbank, DZ and other Landesbanks had solid local relationships. Same was true across Europe. France, Scandinavia, Benelux all had strong and influential banks in market terms. Now? Name me a single European bank active across the whole of Europe? There is not one. The rules mean no external bank can consider it – they would need to submit not only to ECB oversight, but move to Frankfurt! (or worse..) Will European banking union create European superbanks? Perhaps, but I doubt it will be German. I’ll be putting my money on a French name instead.